From Awa'awapuhi Viewpoint, some of us set off on the Nualolo Cliffs Trail bound for Nualolo Ridge. En route, the typical Hawaiian weather of "mauka showers drifting makai" conjured this beautiful anuenue (rainbow) arching across the Nualolo Valley. 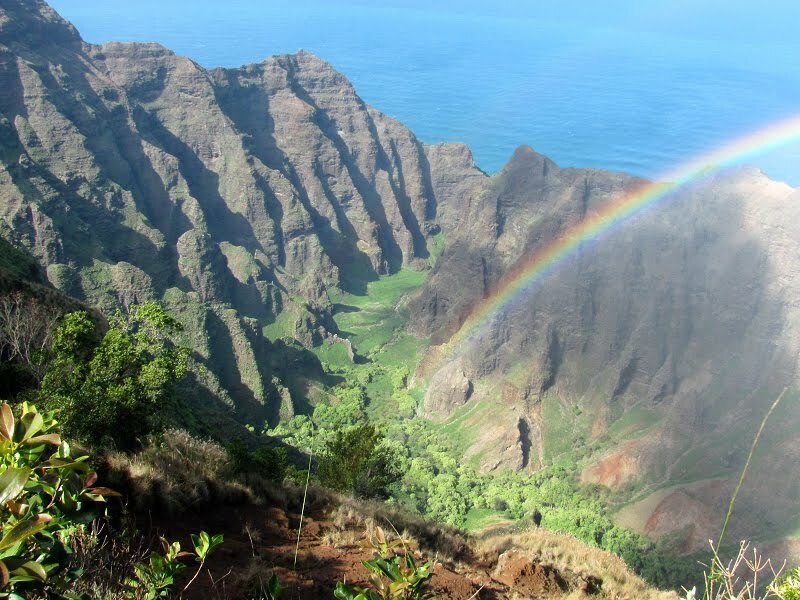 Oh, mauka means "toward the mountains" and makai means "toward the sea." Nualolo, I've learned, means "heaped up brains." The Nualolo Valley was once inhabited, perhaps as far back as 600 A.D. which was about the time the Tahitians settled Hawaii in the second wave of Polynesian migration.